The young Polish baritone Artur Rożek has been collecting prizes in song competitions across Europe, all the while building a career in oratorio, opera and song. His partner in this, his commendable debut recording of German Lieder is Anna Mikolon, who is active as a pianist, teacher and vocal coach. A champion of Polish composers, Mikolon has recorded works by Zygmunt Noskowski (1846 – 1909) and Joanna Bruzdowicz (b.1943), as well as song recital discs with other rising Polish singers for Acte Préalable. Her sensitive, stylish accompaniments fuse beautifully with Rożek’s rich, dark-hued baritone in this repertoire. The genesis for this release was a concert performed by the two artists at the 2016 Gdańsk Music Festival. Some of the items were taped live during the recital, while others were recorded in the same studio a few months later. The songs by Schubert, Pfitzner, Mahler and Strauss that they chose are some of the greatest and most popular in the genre. Their themes - water, night, darkness and aimless wanderings - are practically synonymous with German Romantic poetry and music. Amidst the anguished outpouring of unrequited love, darkness and despair the songs relating to water generally provide a touch of lightness. 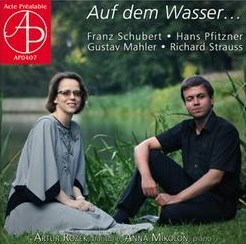 Amongst the latter are Schubert’s Auf den Wasser zu singen from which the disc’s title is taken. A prerequisite for a Lieder singer is a command of and flare for the German language, which Rożek certainly displays. He also demonstrates the intellect to digest and express the sentiments of the poetry. The singer’s temperament and taste appear to run towards the dark and dramatic, and in songs such as Schubert’s Der Zwerg and Prometheus, his talents are displayed to their best advantage. In the former, he vividly relates the tragic tale of a dwarf, whose unrequited love results in a watery, murder-suicide. In Prometheus, Rożek rails proud and defiant against the gods, in a stirring performance of one of Schubert’s most riveting ballads. Pfitzner’s songs show up more frequently on recordings than they do in the concert hall. Drawn to poetry that evokes the loneliness of nature, he was a complex man who lived in difficult times that broke him mentally, financially and artistically. The four songs included on this recording are of this ilk and are particularly suited to the talents of Rożek and Mikolon. With the first notes of Herbstgefühl the listener is transported into the intense, chromaticism characteristic of Pfitzner’s music. Their performances of these songs are the centrepiece of the recording. Rożek’s dramatic instincts and musicianship never falter, but vocally he falls short in some of the songs (and he does take on some of the most challenging ones in the repertoire). It may be the tempo, or the weight of his middle and lower registers, but in Schubert’s Nacht und Träume he displays an unsteadiness of tone and too much vibrato; it never floats. Similarly, he is taxed by the long lines of Strauss’ Befreit. Some baritones resort to crooning, others to almost shouting in giving voice to the intense despair of losing one’s spouse. Rożek’s cries of anguish however, are merely strained and his tone disembodied. The Mahler selections, too, provide lightness with injections of humour in Des Antonius von Padua Fischpredigt and the joys of requited love in Rheinlegendchen. Rożek is on firm ground in the songs of Mahler and Strauss. How lovely it would have been, however, if the last sounds one heard on this disc were of him giving voice to the promise of eternal, heavenly bliss, that he did so effectively in Mahler’s Urllcht. That would have been splendid indeed, with no disservice to the dramatic arc of this choice collection of songs.